When I grew up in Switzerland, my father exposed us to art and architecture and helped us develop a sense of design. He was an architect. My husband, a painter, taught me to see and experience nature. Together we learned a lot about colors. Anywhere I go now I see art, color and design, and appreciate the beauty that surrounds us. Seeing design and beauty and taking the few seconds it takes to truly see them nourishes the soul. I find this to be a great source of energy. As a designer I see myself as a combination of Swiss and European roots with limbs and leaves exposed to the California sun and wind. And California being on the Pacific rim has also more Eastern influences. When I came to California, I really got a sense of freedom and possibilities. Risk taking is part of the reality here. So I was able to experiment in ways not quite possible in Switzerland. I still often feel like I am playing as a kid and wonder what I will do when I grow up, just kidding... though that thought often passes through my head. 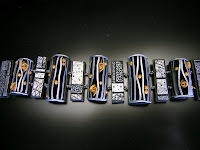 For many years I sold most of my work wholesale, so I was working in my studio, alone, days at a time. My only contact was with the UPS driver and the checks in the mail 30 days later. That was in the golden days for crafts wholesale. Later on when the business model for buyers of handmade crafts changed, requiring us the makers to jump through too many hoops for wholesale, I returned to doing mostly craft shows. I find a lot of satisfaction in the direct interaction with customers. I like setting up a show, creating my own unique temporary retail space for a weekend. I have now lots of repeat customers, some just come by to say hi and to tell me how much they enjoy the pieces they already own, or to see my newest designs. Of course I get affected by the way people react to my work, though I work in an areas of design with techniques that have not always been very popular. It is really a very small niche and fiber and textile arts, since traditionally a women's occupation, tend to be under-appreciated and undervalued. How do you balance the creative side of the business with the "business" of the business? That's always a challenge, and it took me a long time to understand that the business side also needed some creativity and attention. It took me forever to understand the principle of a 'bread and butter' items for example, items that can be purchased easily by customers, like bread and butter, because they are not too expensive compared to their perceived value. Nowadays I divide my time also with my online store. It opened in January 2006. It got its start on a whim with supplies, nylon thread and a few jewelry kits. I thought it would be mainly for my students who could not find thread. To my amazement the store grew, literally overnight... In 2002 I had gone back to school to learn web design. I took one full semester class per semester, designed my artist website, my husband's, had fun one semester with flash animation... I also like the challenge of designing a beautiful website that works. Here is the advice I still give myself all the time: whatever I do, do it to my best ability, create with passion, make sure many of the pieces I create are affordable, exhibit them with care and be ready to pass them along to their future owners, my customers. 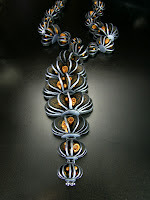 Creating 'objects d'art' is such a luxury and joy, it is nice to share it with others. And if one is able to make a living at it, it really is a form of grace. I love the idea of sharing my knowledge and passion for my work. It will be especially meaningful to know that I have influenced someone in a positive way, just as others have positively influenced me. Also, there is a sense of achievement -- a certain satisfaction of knowing that I have met the approval of my peers to the point of being considered skilled enough to teach. 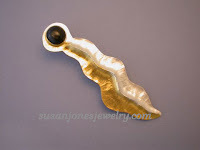 Susan's work can be seen at her website: http://www.susanjonesjewelry.com/. A selection of her work is offered at a gallery called Taylor PO in Taylor, Mississippi. 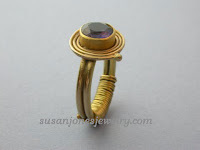 And, her jewelry is sometimes found at the Craftsmen’s Guild of Mississippi in Jackson, Mississippi and the National Ornamental Metal Museum in Memphis, Tennessee. It was a pleasure getting to know Susan! It is clear to me that she is a woman with a mission...first to quench a thirst for knowledge of the craft and now to hone it and pass it along to others. Congratulations to her! Natasha Jade: Beautiful Buttoned and Beaded! I started with basic jewellery, but tried giving it more of an edge- using the buttons as features and the clusters of buttons as a base form to bead over. I really love buttons- the colors, the shapes, the overlapping forms / landscapes I would create out of clustering them together, and the way they would not appear as buttons at 1st glance until you looked a little closer, and it's really nice to take something that has essentially been discarded and turn it into something beautiful. 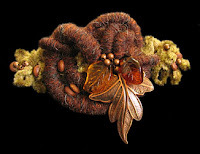 I'm so tactile- I love to touch the fuzzy softness of yarns and felt against the glint of beads and the textures of buttons. 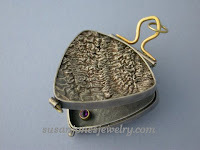 I love the buttons to represent mushrooms in the textile pieces, plate-like fungi. I like to make it up as I go, let the materials nestle around each other as they want to, let the little features "grow" out of the spaces in the forms as though the pieces were scooped up off the forest floor. From beads to buttons to textiles to glass...I love that my vision for things has the chance to keep expanding with the introduction of new materials. I guess the subject matter/ inspiration for the pieces is much the same, it just becomes more refined as I incorporate more elements. Your work is an interesting combination of the very modern with ancient sensibilities...tell us about this. The Enchanted Earth series are particularly a homage to our ancient Mother Earth. She desperately needs our love and healing and in a small way I hope my pieces remind us of how precious our earth is, and by wearing them, we are re-connecting ourselves to her. Adornment is an ancient practice too- worshiping our bodies by the simple act of adorning ourselves. Creative childhood- not a lot of cash so we would make things to play with, make art for the walls, make more of a mess than much else!!! I loved the arts subjects in school, I went on to a diploma of Fine Art after high school, and after that made films wrote/directed/edited/music). I belonged to a medieval re-enactment society and discovered tablet weaving braids but more importantly belly dance- so from there it was creating my own costumes and jewellery galore and performing and teaching dance. I learned to crochet which probably solidified my love of yarns. 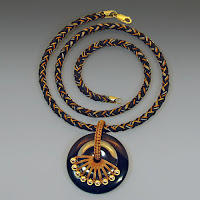 Discovered glass most recently and have begun to incorporate that into my work. A friend of mine was looking to start a business making accessories- mostly handbags and a bit of jewellery, and being that we loved creating things together, I decided to jump on board... as it turns out she decided not to go ahead with it, but I continued and "Jade Adornments" was born. Be brave enough to be original and love what you do! Fashion dictates what is popular at the time and I always found that really frustrating when my heart/soul/inspiration was leading me in a totally different direction. Do what the heart wants- you will be more fulfilled for it and those that love your work honestly will find you if you persist. What a pleasure it was to "meet" Natasha! I am a fan! Most of the designers I met were gracious and wonderful about discussing their work and processes, though three vendors actually shooed me away saying that they didn't want me to take photos of their designs. VERY WEIRD if you ask me. Why, I wondered, would someone AT A SHOW, not want publicity on their work? Maybe someone out there can comment and educate me on this strange behavior. I hope the economy and gas prices didn't put a damper on the crowds. These talented designers deserve great success! 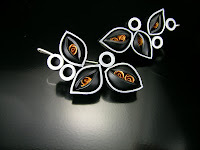 Wonderful Jewels By Wiwat Kamolpornwijit! 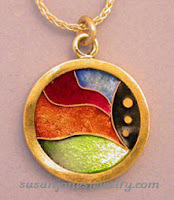 I helped my friend selling polymer jewelry as a fund raising activity for a temple in 2004. During that time my friend broke up with her partner who supplied her jewelry. Somehow I was insane enough to volunteer making jewelry for sale with no prior experience. I spend many hours each day to work the clay. 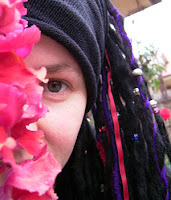 It seemed I held 2 full-time jobs as both an environmental engineer and a craft artist. My life took a big turn at the end of 2006 when my father passed away. I went back to Thailand for the funeral and to accompany my mother. When things got better at home in Thailand I came back to the US and learned that a job promise was no longer available. It was kind of shocking but I also saw this as once in a lifetime chance to becoming a full time craft artist. Under a normal circumstance it’s very unlikely I’d have given up my full time job. I have been a craft artist for about 15 months now. 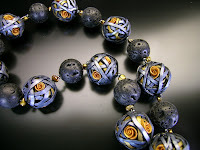 What do you like about the polymer clay technique? What does it offer that other techniques can't do? It helps that there is not much capital investment in working in polymer. I also like its pliability and colors. Caning or millifiore is a very common technique in polymer, it is the same technique used to make Murano glass. Many rolls of different colors and patterns of polymer are placed together carefully to create a pattern across the section. The thin slice of the cane showing the final pattern is used to make beads and surface design. Particularly I like exploring new shapes and the challenge of making it. For example I create a grill-like drum in one of the images by repeatedly slicing a slab of a cane two third of its thickness and splitting the slice. For being relatively new to this industry, you are showing regularly, have a number of retail partners and appear to be quite successful.....yet most designers have said that it takes at least 3-5 years to build a real business. What do you think you have you done differently that has made your business viable so quickly? 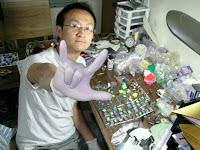 I had made jewelry part-time for almost 3 years before I opted for doing it full-time. So I am not completely new to the business. I’m still learning the ropes and always re-evaluate my plan or my direction based on my experience at shows. Pricing work is a tough task; I priced my work to be very affordable at the beginning and continually increased the price till I started to feel the resistance. Slowly I have gotten better at pricing my work. The approach might be wrong but coming from a completely different field I need to learn how much people are willing to spend on my work. 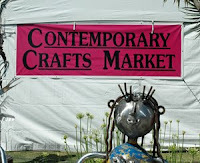 You do craft/fine art shows several times a month. What do you enjoy about these and where do you find the stamina?!! Doing show is a way to get to see people, test new designs, and learn what appeal to customers. The most enjoyable parts of doing show are when repeat customers tell me how much they like my work and when I make some money! Believe it or not I felt a bit stressed when not doing shows. I guess it’s something to do with being so used to having paychecks at the end of every month. Thanks to meditation I’m still sane. When there is so much uncertainty in both being accepted to a show and the sale of the work, I tend to apply to more shows than I should. I think doing shows is a good workout nonetheless!!! You've got to like doing it first, then it is perseverance in my opinion. After I decided to go full-time in 2007, my first show was held in the middle of an unexpected snowstorm. At the second show the gust was so bad it blew my tent away during setup, then the rain pour down so badly, it was a complete mess. Surviving these two shows made doing other shows a piece of cake. Also find a balance between what sell and what you like to make, and don’t hurt yourself! I love Wiwat's unique style and his adventurous spirit! Hats off to him for creating this life for himself. I wish his great success!